Bridge Communication with your own Church App! Have you been frustrated by figuring out what is the best way to stay connected with your congregation? In today's social media driven world what is the best way to keep communication going? Do you use Facebook? What about twitter? Does email work? Just how effective is your bulletin at reaching Millennials? If you look at the statistics over 70% of all internet access this year will come from mobile devices (cell phones, tablets, etc.) and of those mobile devices 85% of their access is via App impressions. If you think about it, when you are on one your smartphones how do you access Facebook? Is it through Safari or Chrome? No, it's through the Facebook App! The problem comes in if you strictly use an App are you abandoning your folks that use flip phones? We at Todays Online Church (www.todaysonlinechurch.org) have partnered with EarnestApps to produce a unique Web App. This App is different in that it acts just like a native App on your smartphone but it can also be accessed via your standard computer! Just try that with something you have to download from iTunes! Our App can run on any platform from smartphone to tablet to PC. Let's take a look at how we solved the church communication issue for one church, Homefront Church of Grandville, MI. We provide an easy way to contact staff. All of the links in the App can be clicked on to make a direct call (if on a smartphone) or an email. We provided a way to organize the church directory! While we can integrate with any online church directory, our system has the added advantage of live links for calling or emailing anyone in your congregation. This is saving their church secretary hours of work and there is no additional cost! Full family pictures are included. The event system was designed to make it very easy for anyone in their congregation to find out what is happening and where! Because it is a Web App means if they made a change to an event the very next person to look at the event page saw their change. So how did they let people know of last minute changes such as bad weather cancellation or last minute change of venue? By using our alert system Homefront has the ability to text the entire congregation with these last minute urgent communications. Remember that text alerts work with the old flip phones! When it came to online giving we integrate seamlessly with Continue to Give! This means that Homefront now had a way in which Millennials (and others) could easily give right from their smartphones without even thinking about a checkbook! We also added a "Live Links" page that gave access to the common online resources that Homefront was using. For example, they have included the YouVersion of the Bible that has the weekly sermon notes and online program. They also added links to their LiveStream for online viewing of the weekly worship service and finally they added a link to the private Facebook Group for the church. It is interesting to note that for the first time in years, since using our App, the Homefront Leader Board does not have congregation communication as one of its top ten action items for the annual retreat! We were able to fully customize the App to make it look like a native Homefront production and we can do the same for any church. Colors, logos, icons, backgrounds and links can be fully customized to your specific church. Support for all platforms - Apple IOS, Android, Windows Mobile, Standard Windows and MAC. Integration with any unique fundraising websites you might already have in place including Continue to Give! Complete customization including layout, color, background, icon selection, linking to any online service. Our fees start at $89 per month and go as high as $300 per month based upon the size of the congregation and/or features needed. 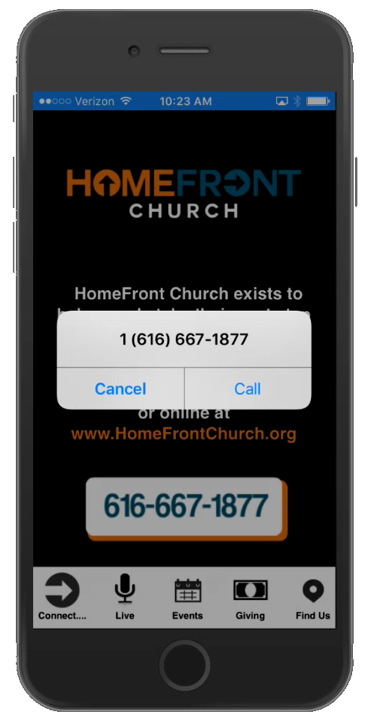 If you would like to see a short video of how we helped Homefront solve their congregation communication issues simply go to www.todaysonlinechurch.org/communicate and at the end of the video we will give you short instructions on how to try our demo version! With our Web App there is NO downloading! If you do try our demo app you will find our pricing built right into it for easy access. Ready to improve how you stay in touch with your congregation? Email us at [email protected] or call 616-437-7970. Today, congregation members are not carrying cash and check, that is why online giving makes it easier than ever for your givers to donate. A lot of churches are now implementing giving kiosks , mobile fundraising, and crowdfunding in order to capture credit and debit donations because everyone carries "plastic". In fact, after a recent study of donations given, it was revealed that over $2 billion were given online in 2015! This answered for a 9.2% increase in online giving in 2015 compared to 2014 and those numbers are still rising! While these facts are great for increasing donations in the church, it does pose some challenges to the bookkeepers for properly keeping track of those donations and accounting for it all. One accounting issue is that accepting donations online has your church or nonprofit reconciling your bank account, constantly. 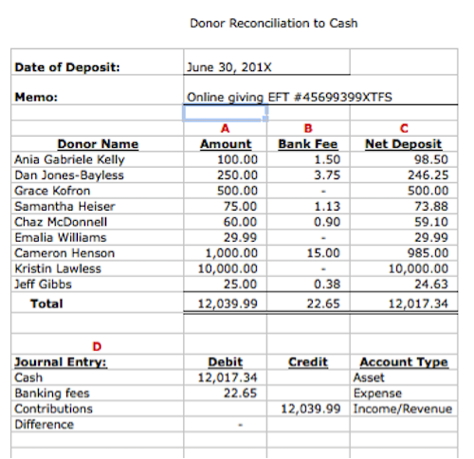 This reconciliation can be very easy with many online donor management softwares, such as Continue to Give, or nonprofit accounting softwares, such as Aplos, available today with great features like bank integration, batch reporting, and real-time reporting. These softwares not only make giving easy but they streamline the process from donation to bookkeeping. In reality, many churches and nonprofits will procrastinate on reconciling their books until the end of the month to account for online giving (which is not the best). To have the best accounting results you should reconcile every other week or every week. In addition, if your nonprofit receives more than 20 donations a day we would recommend reconciling every day. The simplest way to record the contributions donated and balance them with your bank account is to enter the online donations the same way they are reflected in your banking records. This keeps the audit trail clean. We have a great example spreadsheet below. Take a look and you will see that there was an electronic deposit of $12,017.34 on June 30th. The bookkeeper then used her online giving statements and batch reporting on Continue to Give to reconcile the banking records. B = processing fee, transactions fee, merchant account fees, online giving service, etc. that are related to transaction of the donated amount. Remember these suggestions are not meant to be a substitute for professional services, just some tips and resources. Always consult a trusted professional such as a CPA if you seek tax or accounting advice. We are excited to bring you batch reporting for your church donation app . Batch reporting is the ability to see what specific transactions that givers have donated group together to form a batch. Typically you will have direct deposits that consist of a few different transactions lump summed into one. So let's get started on how you can start using Continue to Give's donation management batch reporting. In order to find your batch reports, simply log into your Continue to Give account, and then scroll until you see your reporting tools, or click on the reporting tools on the left side menu. Now you will see different tabs. Click on the Batch reporting tab and you will now see the batch menu. How to interpret your findings: The big thing about knowing batch reports is that if you know 4 donations were made on the same day, only 3 made it into the batch before it's closing time. This will tell you that those three transactions will batch out together into your bank account. You will also be able to differentiate between ACH transactions and Credit/Debit transactions. These will deposit in batches separate of each other. You will also be able to go through day by day to see each batch report, it's total, and what transactions are included in that batch. There are really three natural seasons in giving. There are challenges with each season, but there is also opportunity with each season. It's important to work with the natural seasons and cultures to best fit the type of opportunity you should be taking advantage of. In the beginning of the year there are a couple things happening: debt from Christmas spending, the letdown and depression from the holiday push, New Year's resolutions, etc. There are a few things that people are really looking at and itâs how to better their lives and turn a new leaf. Well take hold of that and start doing 2 minute giving talks right before the offering plate. Let people know itâs a clean slate to the year and how they can start fresh with giving. Itâs also a time when a lot of people will get their tax refunds. Once it starts to become warm and kids are getting out of school, taking vacations the summer, the slowdown hits. Two things happen: people are in church less because they may be on vacation or somewhere else, and people start to become more relational. The beginning of the summer is the time to encourage recurring donations that can be set with onling giving softwares . Because, letâs face it, when you are not in church you typically are not giving. Keep giving consistent all year with automatic recurring tithing. Once summer hits itâs time to stop asking for giving it is a time to build relationships. People are outside have campfires, BBQing, playing sports, and getting involved. This is the time to have church get togethers that are relational. Itâs a time to build friendships and build a vision of the church, the body of christ, and where everyone, including the pastor, wants the church to go. Typically people that are invested and have a relationship are dedicated givers, because itâs not only the pastor's vision to grow the church, but itâs each congregationâs vision now as well. Towards the fall and seasonal time of the year, people are in the giving spirit. You have a few things going for you. People are coming back after the summer season and itâs a time to have giving sermons again. Take advantage of that giving spirit and remind them about giving to the church. This should be a time to reap the relationships youâve invested in over the summer. Itâs also a time to get in their last taxable gift before the start of the next year. We know your church is meant to do big things! So keep giving your congregation the big vision of where, as the body of Christ, the churchâs goals are. Share your hopes and dreams of all the church can be and let the congregation be a part of the goals and how to get there. Ok so you have done all your research and found the perfect donation management software for church tithes. It's perfect you have your offering kiosk, your mobile fundraising, text to give, online donations options, etc everything you need for features and capabilities. And now you're going to go live and let your giver's know how they can give easily to your church or nonprofits, BUT what are the most successful ways to accomplish this? Sending out an email or snail mail is one of the most efficient ways to reach your givers past and present. In the email you will want to show them all the cool technology you have just implemented. Ask their opinions on if they think the new way of giving is easy or not. The goal is to have them try to donate and let them critique it which will encourage more participation than an email that just says please give to us. Be sure to include the link and text to donate options in the email. Tip: make sure to embed the link in a picture button or wording. It looks better then having a large blue link in your email! If you are a church the best way to introduce the new giving options is to show a video of all the new features the congregation can enjoy. This can make the giving process easy since they will witness a demonstration before they go up to the offering kiosk to give or before they give online. Plus if you have your mobile tithing options in your bulletin they can try it out as they watch the video! Plan and host a fun event where all your new giving avenues will be present. You could do a car wash, bake sale, etc. Have your offering kiosk or fundraising kiosk present for people to pay at. Have text to donate button on posters that market the event. Get creative! Google some church fundraising ideas and use your new software to be a part of them. It's important to introduce your new giving options to your supporters. For one you're contacting them and reminding them to give to your cause. Make it about them. Ask them if the new software is easy to use and what they think. The point is to ask for donations in an indirect way of celebrating the new software. Haven't found that great donation software yet? Check out Continue to Give's online, mobile, kiosk, facebook, and crowdfunding software! Churches have been around for many years. As the world is constantly changing, religious organizations have had to find new ways to sustain their places of worship, keep members actively engaged, continue to bring new members, and keep up with the times. Some ways churches raise offerings are throwing bake sales, family events, and more. One constantly changing and improving thing is technology. The internet has grown into something that many people in today's world use on a daily basis, whether it's paying bills, shopping, or staying in touch with family and friends. One of the greatest things that the internet has brought us in the past few years is online fundraising. Many websites have been popping up helping people help others by raising funds online. Fundraising has become a great way to help raise money for causes and helping reach people all over the world. Churches have cautiously moved into the world of online donating to stay up to date and help make tithing and offerings more convenient for their members. Technology has been a wonderful advancement to everyday living. With so many options and competitors, it can be difficult to figure out what is best for your church. Any site can allow you to donate online, but what about other options? In this technological society, you can now donate via your cell phone, tablet, anywhere, and anytime! Summer is coming soon, which means more people going on vacation, camping, and just enjoying the time they have together before winter and school begins again. A great option Continue to Give offers, is recurring donations. It's a wonderful option to have when life gets busy. Churches can also plan future budgets knowing they have a steady amount of offerings even if you may not be able to attend on a weekly basis. Another great tool to help raise tithing and offerings for your church is an offering kiosk . Kiosks can be used in a variety of ways: set up indoors, at events, used for church daycare or even concerts. With all the options available today, it's important to think about what your church needs to continue to grow and continue to serve generations of families. Unlike many other sites, Continue to Give offers the whole package to everyone and we strive to make our donating process as easy as possible for you and your members.